This is just for my own benefit, to lay another tiny milestone in this blog. Today this blog reach a humble 200,000 pagehits doubling the figure of June 20, 2012. I realised I like writing/blogging very much as it broaden my perspective and it encourage me to dig and search further on things and issues that interest me. This blog is mainly about Green Technology, but of late there were many articles on IT especially gadgets and tools that affect our daily routines in big ways. Also, pictures from my photography passion seem to crop up more. However, in no way this would take away my focus on renewable energy and green technology. 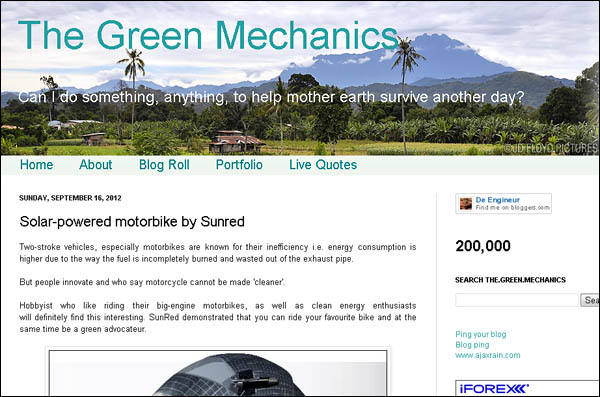 By the way, you can read about the Solar-powered motorbike by Sunred, captured in the above snapshot. It's a very interesting armadillo 'scaled' scooter.